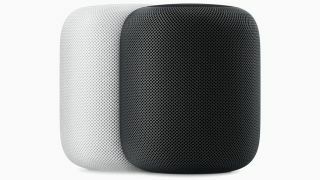 Apple slashes price of its HomePod smart speaker | What Hi-Fi? If you've been holding out buying an Apple HomePod smart speaker, now might be a good time to buy. Without fanfare, Apple has dropped the price in the UK and across the Atlantic. So, you can now pick one up for £279 in the UK (down from £319) and $299 (down from $349) in the US. If you're fully immersed in Apple's ecosystem and subscribe to Apple Music, then the HomePod makes a lot of sense - and this John Lewis deal throws in a free three month subscription to the service. It's not the first time the HomePod has been discounted - it was £279 during the 2018 Black Friday sales, but it's the first official drop we've seen. Handily, the HomePod also happens to be one of the best smart speakers we've tested so far. It sounds entertaining, goes loud and is easy to use - you couldn't really ask for more from this type of product. Yes, it's still more expensive than an Amazon Echo Plus or Google Home, but we feel it's worth the extra. Not a fan of Apple or Apple Music? We did spot a great saving of over 50% on the LG WK7 ThinQ Speaker, now £89 (down from £200). This smart, Bluetooth speaker uses Google Assistant and some retailers are also offering a free 6 month subscription to Tidal as part of the deal.